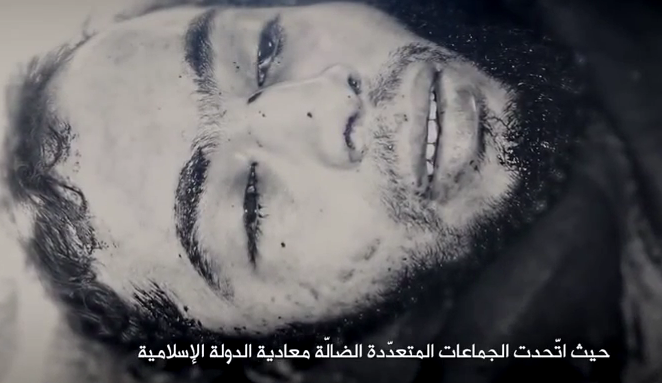 A terrifying 55-minute film released by ISIS a few days ago exposes just how dark the groups' ideology truly is. While the Bush administration made it almost impossible for the media to photograph the caskets of soldiers returning from Iraq and Afghanistan, ISIS seems to revel in showing their fighters dying in slow-motion, to the sound of Koranic songs. Though most media outlets have concentrated on the terrifying fact that the narrator appears to have a North American accent, and that also the final scenes, the closing executions, are carried out by another individual with an American accent, Flames of War is primarily a mockery of America's culture of death. 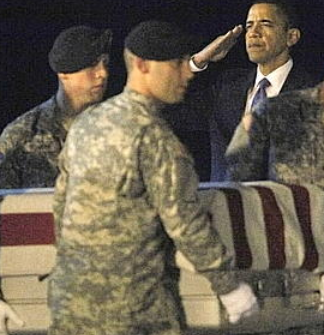 Shortly after Obama was elected, he made it a priority to receive the bodies of troops returning from the battlefield. According to London's Guardian, Obama made an "unscheduled, late-night visit to Dover air force base... as the remains of 18 US soldiers and drug enforcement agents were unloaded from a military aircraft and returned to US soil." How unscheduled, exactly, and how realistic the unloading of the bodies was, is a matter of grave dispute. In 2013, NBC published an article -- Pentagon unit held 'phony' ceremonies for MIAs, using planes that can't fly -- where they reported that an investigation had forced the Pentagon to confess that "no honored dead were in fact arriving, and that the planes used in the ceremonies often couldn't even fly but were towed into position." Though the full extent of the deception was not revealed, NBC uncovered that the fake ceremonies had been taking place for seven years. One veteran, who had attended over 50 ceremonies, proclaimed: "If I have been fooled, I am going to be a very pissed-off citizen, because I've been going for years... I don't know when they [Department of Defense] stopped being honest and switched over to this Mickey Mouse, but whoever did it, I hope they find him a new job somewhere." When Obama went to "receive" our fallen warriors, it's a possibility that he was merely taking part in an imaginary American ritual glorifying death. With ISIS, however, there's little doubt as to whether rituals are staged. While a mujahideen lies on the sand dying, the American narrator proclaims: "With his Kalashnikov beside him, the mujahid lied waiting as his soul was gently lifted up to heaven on a journey to the afterlife," to be followed by a Koranic song and more images of war. 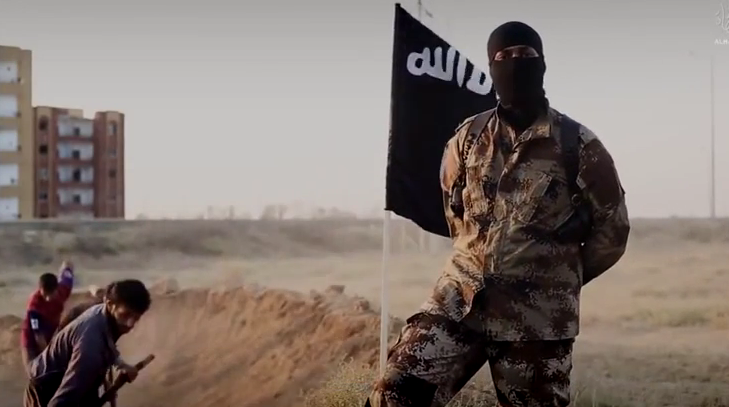 The narrator then returns, and over the face of a dead ISIS soldier, he states: "The mujahideen of the Islamic state would only accept victory or martyrdom." It would be unthinkable for an American news network to show images of American soldiers dying. During the Vietnam War, reporters were embedded with troops and shot footage that made the war feel very real for those living in the United States. Though camera technology has improved exponentially since the 1960s, the first phase of our current war in the Levant was sanitized and censored in comparison to what American audiences experienced during the height of protests against the Vietnam War. Today, American news networks wouldn't spend 30 seconds showing the last breaths of a GI coughing up blood and crying for home, but ISIS will. While the death of a US soldier would traumatize the nation, ISIS seems to revel in the death of its soldiers. 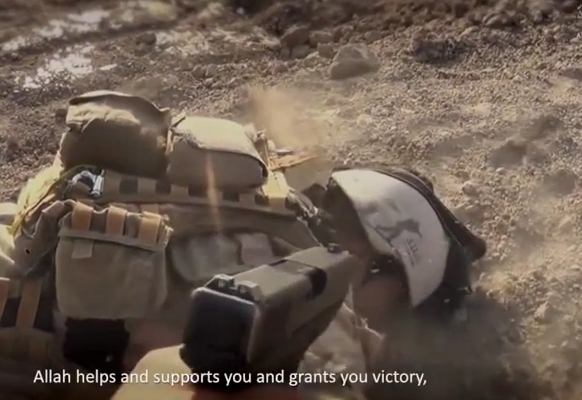 Even their infantry is willing to die, making them a very lethal adversary. The number of Americans in their media ranks means that they will know how to measure the response of the US public to certain images, as has been the case with the spate of beheadings. It's already clear that images of ISIS soldiers dying brutally will do nothing to harm the morale of the group; if anything, it will bolster it. A group that shows the death of its foot soldiers in slow motion in a way that makes war into a noble R-rated film cannot be underestimated. One thing is certain, this war will be nothing like Operation Iraqi Freedom. The enemy now has the power to reach the screen of every American with an Internet connection. Flames of War mocks America's Hollywood violence, editing videos in the same way that a blockbuster would, but adding just enough documentary-like scenes of real brutality to ridicule our R-rated films. While ISIS enjoys scenes of its members dying, this war will be as bloody and painful to stomach for the American public as Vietnam was.